Today's post features original rheology data. I can't really call it origianl research, as it is something that is not surprising in the least, but at the same time too, it is something that I have never seen formally documented. It's been nagging at me for a while, so I thought I would give it a run on some polystyrene sitting around the lab and see what happens. Whenever I get a new sample in for rheological characterization, the first screen that I run is a strain sweep, such as you see here. At low strains, the storage modulus, G', stays constant, but at higher strains, G' begins to drop. (Need a primer on G'? You can get it right here.) The flat section is the linear deformation region and is very important to many rheological measurements. Typically, once a sample is put into the rheometer, you expose it to multiple measurements (various strains or strain rates and all at one or more temperatures). But at the same time, polymers have a "memory" of how they have been previously deformed. They do not relax instantaneously, but can need seconds, minutes, hours or even in extreme cases, days and years to relax. So how can we resolve this dilemma of a polymer that remembers with multiple measurements on the same sample? By working in the linear region. In the linear region, the deformations are small enough that what happens in one measurement will not influence what occurs in the next. So by looking at the plot above, you can see that for this particular polymer, a strain of about 50% or less will still be in the linear region. Rheometers, like pretty much any analytical equipment these days, are computer controlled. 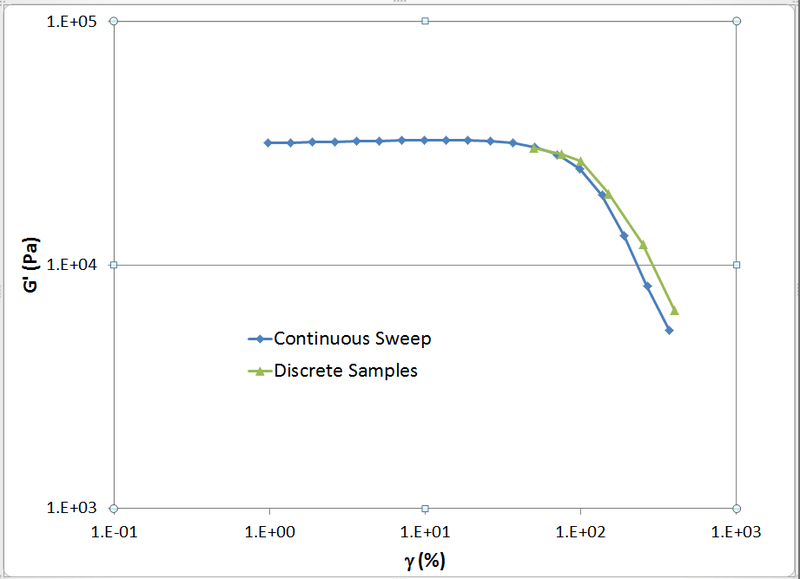 The plot above was made using the strain sweep program which starts at the lowest strain measurements and increases the strain over time automatically. 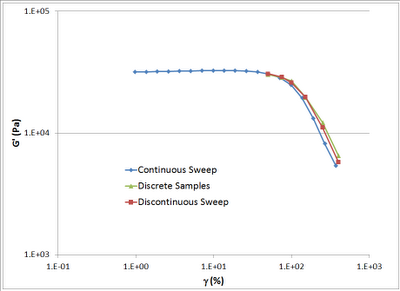 A sweep like this is done in about 2 minutes depending on how much the strain is increased between measurements. The problem with the output above is that it is wrong. Or at least, the nonlinear region is wrong. Why? For the reasons I gave above. Once the strains are high enough to result in nonlinear deformations, then the sample still has memory of that deformation while the next measurement is being started. The plot below shows the same data as before, but also shows additional data in the nonlinear region. Each of those samples was taken by putting a new sample into the rheometer for each measurement. (A big hassle, let me tell you.) As expected, there is a difference. 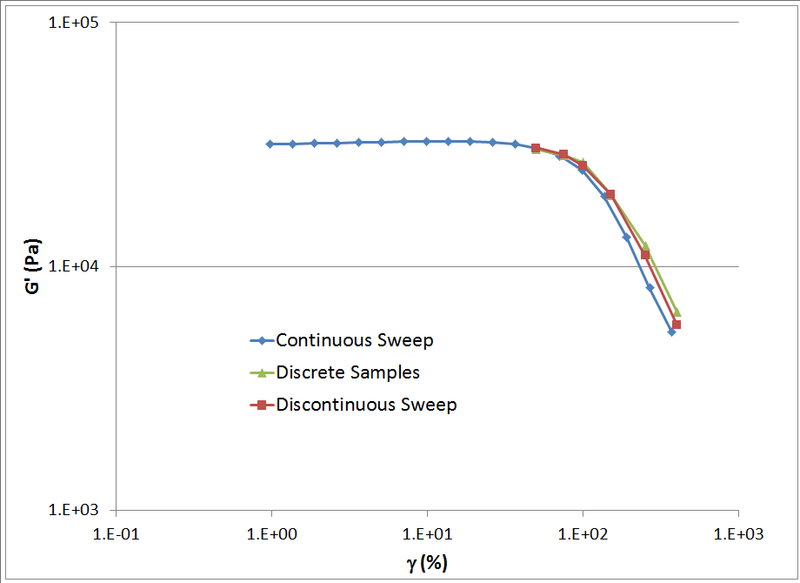 With the continuous sweep, the deformed polymer is already shear-thinning does not recover from that state before the next measurement begins. Hence the next measurements show more shear-thinning than actually is present. One last plot. This is the same as before, but has a third set of data that is a combination of the two measurement options. It was made with a single sample, but each measurement was made 60 seconds after the previous one. 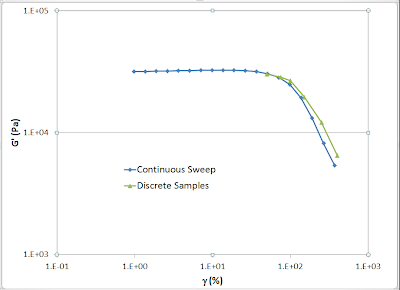 At the lower strains, G' tracks what happened with the individual samples, but at the highest strains, it begins to drop below that curve, just as the continuous sweep data does. This says to me that the 60 second interval is enough time for the polymer to relax from small nonlinear deformations, but not the large ones. All in all, this is what I expected to see, but as I said initially, I've never seen these actual plots - just an admonition to work in the linear region. If you ever wanted proof for that guidance, now you have it. That said, LAOS (Large Amplitude Oscillatory Spectroscopy) is a very active research area that is in fact making measurements in the nonlinear region. From what I've read of it, I'm not even sure that the single point measurements that I made are that correct either. Very interesting. Does that mean PS is thixotropic? No. Thixotropy means that at a constant shear rate, the viscosity drops over time. 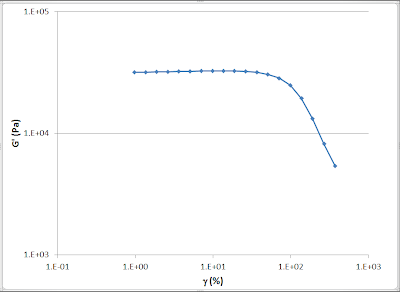 A plot of this would similar, having viscosity on the y-axis, but would instead have time on the x-axis. The shear rate would be kept constant just as it was here. You are right. I consider thixotropy as strain induced viscosity decrease or network/entanglement rapture. It will be interesting to see this result: at a constant strain% (>100%), monitor the G' or complex viscosity, to see if they drop over time. The other concern is that the polymer would degrade over time. 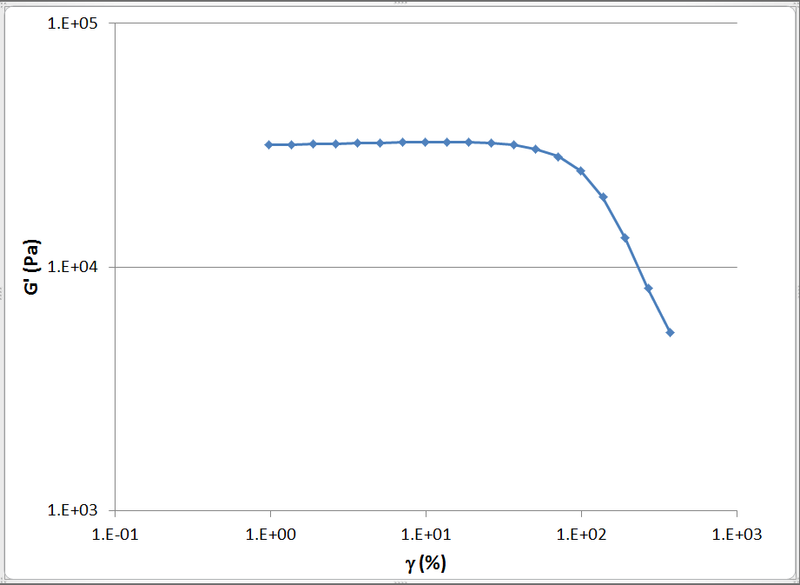 Shorter chains would lead to a viscosity drop, but that drop is NOT consider thioxtropy. If I get a chance, I'll run some of the PS as you suggested.